Our family's staying at two villas, one bedroom villa and the other one of two bedroom villa, of the property which we occupied was amazing. Location; cleaning services within the villas and surroundings; maintenance of swimming pool and bush flowers; equipment and kitchen appliances, villas architecture, all were perfect. Evenings sea breeze outside the villas and fresh air withing the villas were another advantage, no need to turn AC on. All the above, owner Spiros was as friendly as pleasant. Definitely want to go back to enjoy the relax among olive trees. Thank you Spiros! The owner hospitality; internet signal was strong; both villas are equipped with sufficient cutlery and kitchen appliances; swimming pool; cleaning; fresh air; quite area not far from the beach, and many others. Spiros the places host was maybe the best one what we have been anywhere at the all time (and we are travelling quite a lot). Property was very clean and enough facilities. Private pool and the garden was all the time excellent condition during our stay Villa Aggelos. You can ask to Spiros everything anytime and he solved the problems that’s guaranteed. Great stay, thanks Spiros! Great villa and private pool. Enjoyed the bbq, terrace area and all tge facilities. Great that there is a cleaner and pool guy everyday. The location is also great between local beach (3min walk away) and town (short 4 min drive away). Just enjoyed a very relaxing stay here! The villa has everything for a nice holiday - clean pool, beautiful garden, barbeque, cozy furniture. The place is quiet. The owner - Spiros is very helpful. 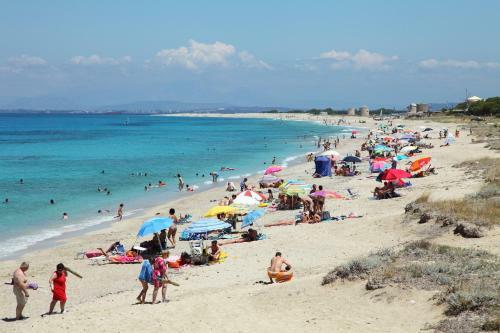 I highly recommend this place because it has a very good location to the seashore, picturesque, comfortable atmosphere, quiet and pleasant environment and extremely polite and responsive staff in the face of Spiros and his team. We really loved our stay at Villa Mela. The house was really nice and we enjoyed the garden and the pool and the old olive trees. The owner, Spiros was very friendly and helpful. We must admit that we are a cat loving family and we had several cats visiting us every morning and night. It was a very quiet neightbourhood, and waking up hearing the roosters and the bells from the monistry was a good way start the day. We had cleaning every day - both the pool and in the house. We rented bicykles and the area is perfect for that. We spent two weeks in Kydonies Villa and its lovely and peacefule place. Villa Fotinos was very suitable for family with two children and pool & back yard was really relaxing as well. Spiros is magnificent host, who takes care and help in every small detail with happy face. Lock in a great price for Kydonies Villas – rated 9.4 by recent guests! One of our top picks in Lefkada.Quietly located in an olive grove in Agios Ioannis, Kydonies features fully equipped, independent villas with a private pool 1,000 feet from the Blue Flag Agios Ioannis Beach. Lefkada Town is 0.9 mi away. 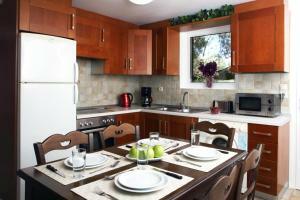 The spacious villas have a kitchen with dining area, stove and fridge. Each includes a seating area with sofas, a satellite TV and DVD player. All villas have direct access to a private garden that has sun loungers and offers views of the countryside and mountains. Bars, cafes and tavernas are within proximity. Free private parking is available on site. 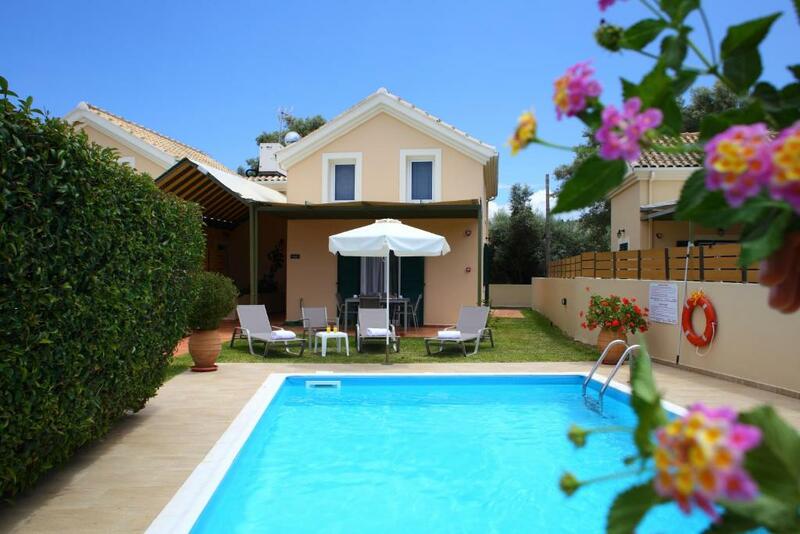 뀐 Located in the top-rated area in Lefkada, this property has an excellent location score of 9.0! When would you like to stay at Kydonies Villas? The layout of the houses-villas, the swimming pools and the garden will make you love our property. Moreover the location of Kydonies Villas is the big advantage. 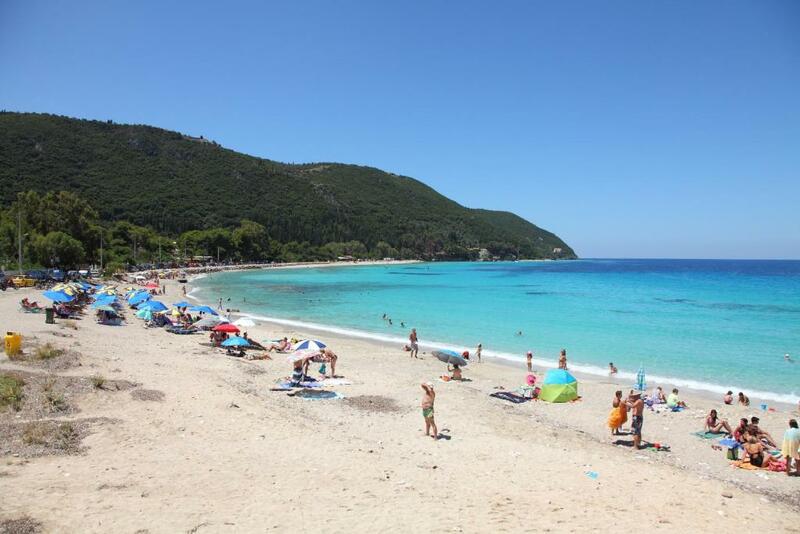 The villas are close to the beach and a short distance from the city of Lefkada. Kydonies Villas are only 250m away from the famous blue-flag beach of Agios Ioannis which guests can access in 3minutes on foot from the Villas. The surrounding flat area is ideal for guests that prefer walking in the countryside and take a nice romantic walk along the beach especially during the sun set. In the beach guests will find very nice restaurants, coffee places and bars. Agios Ioannis beach is also famous for the windsurfing and kite surfing activities. Just above the villas in the mountain is the Monastery of Faneromeni where you can visit either by car or walk from the Villas. House Rules Kydonies Villas takes special requests – add in the next step! Kydonies Villas accepts these cards and reserves the right to temporarily hold an amount prior to arrival. Kindly note that the property wishes to be informed about the exact number of adults and children with their ages upon reservation. Please inform Kydonies Villas of your expected arrival time in advance. You can use the Special Requests box when booking, or contact the property directly using the contact details in your confirmation. It is not negative, it is just a fact and when you know it, it is quiet okay: For sure you need a car to reach the house and to go out in the evening. Only slightly minus was at the range of restaurants nearby especially when you travelling with the kids who needs food quickly. Maybe we use to next time more home delivery services especially on lunchtime. Maybe another corner couch would make it more comfy for lying down and relaxing in the lounge, but the space, the facilities and everything was perfect! Adding a thin duvet in the bedroom might give another comfy sleeping option other than sheet and quilt. I had booked two villas at the property, but did not find any weakness that needs improvement. Nothing much to complain about. If I should think of something it must be that the beds are a bit to hard.